Radio has reach and emotional environment working in its favor. The September 2012 MBI Touchpoints study confirms radio’s large reach, finding that 85% of 25-54s tune in to listen to AM/FM radio each week. That compares to a quarter who listen to satellite radio or the 15% that listens via the web. “More AM/FM radio is consumed out of the home than any other medium,” Arbitron SVP Bill Rose explained, noting the value to marketers. “It delivers consumers when they’re near retailers, restaurants and other shopping venues,” he said. The research shows the proportion listening away from home increases on weekends. Few advertisers put all of their budget into radio, so Touchpoints also looked at how radio did when it was combined with other media. It found that when radio is combined with TV, the total reach of 25-54s jumps to 91%. 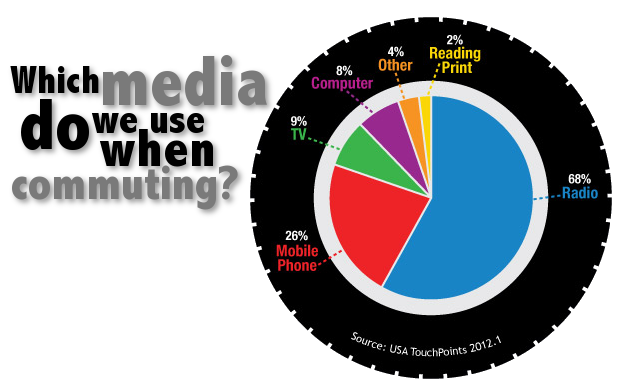 And when the internet is factored-in, the unduplicated reach of the three media is 96%. “These three media combined reach nearly all 25-54s,” Rose said. The study also puts radio at the top for media consumption when a person is feeing happy, positive or alert. That may not come as a big surprise since programmers have long known that one of the big reasons people tune in is for a pick-me-up. Rose says that has implications for sales too. “Advertisers may want to have the positive feelings that radio listeners have when they’re tuning in associated with their particular brand,” he said. The study included a sample of 2,000 adults aged 18 to 64 who downloaded an app on their smartphone and then were asked about their media use every half hour.